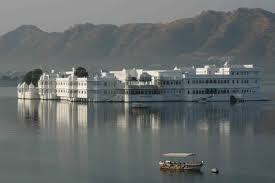 Lake Palace is one of the famous attractions of Udaipur which is strategically located on the Jag Niwas Island. This Palace is spread over 1.5 hectares of the island in the middle of the Pichola Lake. It was built by Maharana Jagat Singh in 1743 and was considered as a royal summer palace. Now it has been converted in to a five star palace hotel. This five star hotel attracts many tourists from all around the world. This hotel is accessible by boat or a chopper. The private residence of royal family of Mewar has been converted in to one of the world’s famous luxury hotel. The unique feature of this palace is that it is floating in the deep blue waters of the lake overlooking the distant city. This palace is located away from the rest of the city. The construction of palace is similar to other princely constructions. It houses 83 rooms and all the rooms are furnished with the best resources available in Rajasthan. The exquisite handicrafts, textiles and furniture of the palace will leave you spellbound. The architecture of this palace resembles a lot to Rajputana and Mughal style. Lake Palace Udaipur is a must visit palace on your trip to Udaipur.